Discussion in 'Playstation - PS4 & Vita' started by RottenFox, Mar 7, 2013. Discussion is continued from the *Part 5* thread, here! I have ten ps4's in my house. If some of you give me your bank details then ill ship you one to beta test. Did anyone fall for that before reading this statement of me confirming that I'm lying? If, come Christmas, the Japs and Americans are playing on shiny new PS4s and I'm not, I'll have a face like a smacked arse. Graphics card maker Nvidia has confirmed PhysX And APEX support for the PlayStation 4. "Game designers use PhysX and APEX technologies for collision detection and simulation of rigid bodies, clothing, fluids, particle systems and more across a wide range of platforms, including desktop PCs, game consoles, and mobile and handheld devices," explained the firm. "Taking PhysX technology content creation to the next level, NVIDIA APEX technology lets artists create intricate physics-enabled environments. They can expand the quantity and visual quality of destructible objects; make smoke and other particle-based fluids integral to game play; and create life-like clothing that interacts with the character's body to achieve more realism in their games," it added. What that usually means in literal terms is an overload of particle effects, enhanced explosions and intense levels of environmental debris erupting at every given opportunity. Here's one of Nvidia's most recent demonstrations of PhysX and APEX tech, using free-to-play PC shooter Hawken to show off some high-end particle physics - just to give you some idea of what might be possible on PS4. I wonder if this engine prevents the annoying glitches (or GFX limitations) of limbs going through walls when you kill someone, say call of duty. game are window based  they opened steam on linix recently and there was only 60 games available!!!! Either way gen gaming is going to look awesome on projector!!! I think I need to win the lotto to free up more gaming time!!! me too. too much glitching. its not so bad offline but online it can get you killed. It's International Women's day today so surprise your wives with a PS4 preorder. "Honey, you've been working so hard to keep the house clean, food on the table, and socks in my drawers. So to show you how much I appreciate you and am proud of you, I got you a PS4 on preorder." She'll hang out on our forums while you're hogging the PS4! Found this link to a tweet from Shuhei Yoshida, President of Worldwide Studios, Sony Computer Entertainment on another site. The only system requirments I can see for the Oculus Rift is an HDMI port. Will the Oculus Rift Developer kit work with my Xbox 360, PS3, Wii or next gen console? Not yet, The Oculus Rift developer kit will target PC-only. We hope to make the headset compatible with major consoles and mobile devises in the future. I wouldn't get to exicited about PhysX with PS4 it will be software emulated as AMD hardware doesn't have hardware PhysX as that's a Nvidia exclusive, you wont see the level of detail and FX as in the demo vids it not possible with software alone, If anything it's a Dig by Nvidia to say look what you really could of had if you stayed with us. Hard to say that at the moment though, maybe after somethings shown or more information is made available, but I can't see them spouting this, then letting it get gimped somehow. Maybe everything slung together will show off some nice touches/effects, or more. I hardly see it as a "dig". Look what the ps3 did with very limited memory and Lightweight gpu. ok i may have been off the mark with Nvidia dig remark but really all Nvidia are saying is that PS4 will use PhysX which with it being more PC based isn't surprising AMD does use PhysX but as i said it's software based, the video that CVG used to show the differences with Hawken isn't a fair comparision as it was used to show off Nvidias GTX 600 line of graphics cards which of course has Hardware based PhysX and one of the promotion points Nvidia uses against AMD cards. in the end with PS4 and software PhysX it will be better than no PhysX at all which is a great thing it will for sure add to the games , i guess all im saying is people shouldn't look at that Hawken vid and think PS4 will be doing the same level of PhysX becasue it cant. hardware? surely its running in a "compute" type environment, in Nvidia this would be its CUDA cores/language, but it will still be software simulations just offloaded from the CPU to the GPU which really is suited to that sort of task. This is running on the graphics hardware but its not a secret type of processor so really there is no reason for it to not run on an AMD GPU. Michael Pachter really does love to pluck things out of thin air. He reckons Micrsoft will win next generation, when their console Hasn't been announced. yeah. i just saw that. I've been disregarding pretty much anything Pachter says for years now. 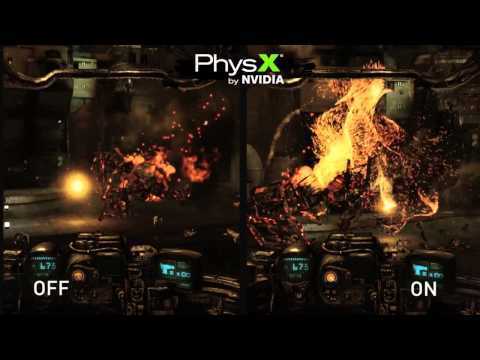 Here's a nice video showing physx on mafia 2, Good to see will be getting stuff like this. 1. Skype is available on the Vita so surely it will come the PS4 to. 2. Why do I need a TV tuner (Freeview) when I have Sky TV. I will buy the PS4 ultimately for gaming. Sky Go on PS4 would be nice though. I reckon Sky Go app will appear for the PS4. Question Current PS4 part-ex/upgrades schemes?